This picture is of my middle child, about 3 years ago. We decided to take a summer break, and checked into a local hotel with a water park. 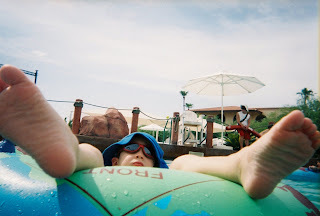 This shot was taken while we were tubing around their lazy river. It was a wonderful weekend, and one we've talked about repeating, but haven't. I love how his toes are sticking up, and he looks completely relaxed and at peace. I came across this picture this week, and have been thinking about making a reservation ever since. Tell Me Thursday is for all the folks who play Wordless Wednesday -- but want to share the story behind their picture/s! Love it when photos remind us of such good memories. Love your post. I am always taking photos of my feet. I actually post one like that a couple weeks ago. Not sure why, put the feet photos always take me right back to the moment.